Come on in! The party’s about to begin! My family is crazy about basketball! We’re recording and watching as many of the college playoff games as possible and I’m getting ready to host a We Are the Champions Basketball Party featuring REESE’S Miniatures! Yes, We are the Champions song is running through my mind. I picked a champion theme because we’re a house divided. When my next-to-the-oldest daughter got married, she went over to the dark side and became a fan of her husband’s team. The problem? Her husband’s team is our team’s biggest rival. No worries, my party will unite us all. Basketball parties are the best because everything is casual and laid back; no dressing up required. I just pull on my favorite team jersey and jeans and I’m ready to party. The food always takes center court! You know all those basketball trophies your kids received in high school? The ones you have no clue what to do with? Dust those babies off. They are about to be showcased as your centerpiece. If you no longer have them (I won’t tell) borrow a few from your neighbor. And the MVP award goes to . . . The Most Valuable Player award goes to REESE’S Cream Cheese Swirled Brownie Cupcakes with Peanut Butter Frosting. That’s a mouthful! REESE’S just happen to be a huge family favorite and I use REESE’S Miniatures 2 different ways in this recipe – in the middle of the brownie cupcake and to top off the peanut butter frosting. As I was shopping for my party, I headed straight down the candy aisle at Walmart. When I grabbed the REESE’S Miniatures, I couldn’t help but notice a huge party bag of assorted REESE’S miniatures (dark, white & milk chocolate) so into the cart they go. I’ll place them around the room in small bowls to snack on throughout the evening. I always gather all the ingredients together before I ever start baking. Then I melt the chocolate and butter together on medium/low, stirring frequently so it won’t burn. After adding the eggs, sugar, and flour, I scoop the brownie batter into a baking-cup lined muffin tin, making sure to fill each cup 3/4 full. After dropping spoonfuls of cream cheese mixture into the brownie batter, use a knife to run through the batter so that it looks all swirly. Don’t forget the add the REESE’S Miniatures before baking! Place a miniature into the middle of each cupcake and push down until it’s even with the batter. Here’s what the brownies look like after baking. Allow to cool completely before frosting. Here’s the finished product! Caution: Hide them all until time for your party! Trust me on this one! My entire family, including the grandkids, voted my REESE’S Cream Cheese Swirled Brownie Cupcakes “by far” the best cupcake they had ever eaten. I just hope my favorite basketball team performs as well! ¾ cup unsalted butter, room temp. In a medium saucepan over low heat, melt chocolate and butter until melted and smooth. Remove from heat and stir in sugar until well combined. Add flour, eggs and vanilla and stir until combined. Place cupcake liners in a 12-cup muffin pan and fill each liner ¾ full. Set aside. Place cream cheese in a mixing bowl. Mix with electric mixer (medium speed) until smooth. Add sugar, egg and flour and mix until smooth. Drop spoonfuls of cream cheese mixture onto tops of brownie batter. Swirl cream cheese mixture into chocolate mixture by gently running a knife back and forth over the top. Unwrap 12 REESE'S miniatures and press in the center of each cupcake batter until even with batter. Bake at 350º for 20 minutes or until a toothpick inserted near center comes out clean. Cool for 10 minutes on baking rack. Remove cupcakes and cool completely before frosting. In mixing bowl combine butter, peanut butter and vanilla. Mix until smooth. Add in powdered sugar, one cup at a time, mixing after each addition. Add whipping cream and beat on med-high until fluffy. Pipe frosting onto each cupcake and top each with a REESE'S miniature. Love the centerpiece idea! I would have never thought to use trophies, but that’s such a great idea! And I love Reese’s and seriously want one of those cupcakes. Looks so good! Those brownie cupcakes look sinfully good! You throw the best parties – I wish I lived on your block! Alli, you ought to be ashamed of yourself for that luscious cupcake recipe this morning!!! OMG! I need my Hubs to make these for us! We watch every sport in the world at our house including basketball but I’m not the one watching basketball. My hubby keeps up with it and watches the highlights. He’d watch all the games if he could eat that delicious party food! Your parties are always adorable, but you had me at the chocolate peanut butter cupcakes!! OH MY YES!! I am not sure if I would have enough Reese’s minis left to bake with lol. Those things are like kryptonite for me and I would eat most of them before they made it into the cupcakes. Gorgeous party, as always! I love the portable food especially the individual cups. I HAVE to make your brownies! My husband loves Reese’s peanut butter cups so I know these will be a hit! Holy wow those Reese’s brownies look good. I’ve never been much of a basketball fan, but my dad is and I know he’ll love all of these snacks! Love the free centerpiece idea! And the cupcake recipe looks awesome. 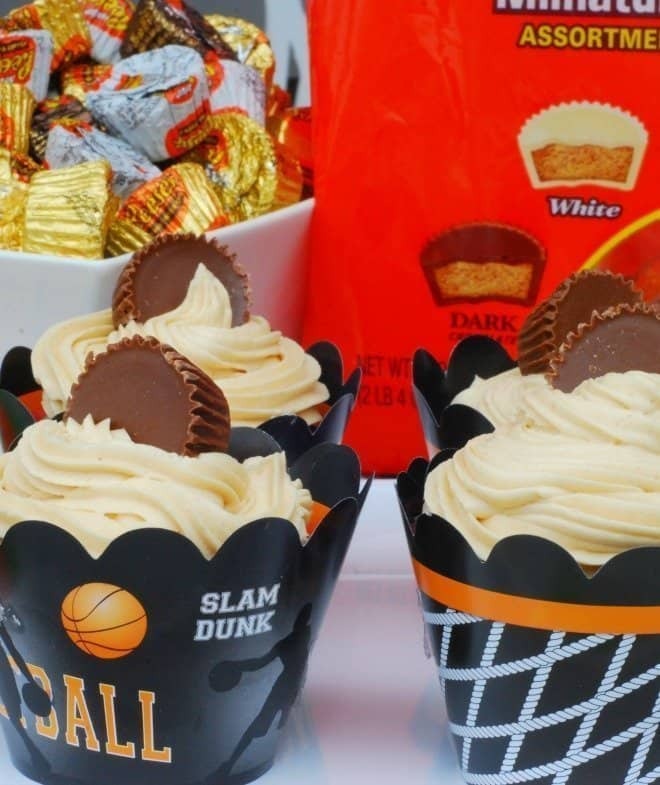 My boys would love this fun basketball party! What a fun spread. I love the centerpiece and the way you have all the treats arranged and contained is great. OMG THOSE CUPCAKES! I need to make those for something. Pinning! The cupcakes were delicious! It was a good thing I did yard work all day to burn off those calories. Wow! We can just skip dinner and get right to the dessert…lol. Those brownies look AMAZING! Honestly, though, all the items featured seem really delicious. I’d really love to try the mini chili dogs. My family would have a blast eating those. Your party spread looks wonderful. Anything with Reeses in it is a winner for me since it’s one of my favorite candies 🙂 Pinned. OMG all this food looks simply delicious! But those cupcakes are to die for! That would be a hit at any party! I gotta save this recipe for my daughter’s birthday coming up. as usual so pretty and creative!! A friend at work made a similar Reese’s pieces combo as a brownie and it was to die for! Love those cupcakes! Nadeen recently posted…Miami Beach Hotel Review: Hotel Astor! You did an awesome job setting up this party! The cupcakes look so delicious as well! Those looks so tasty. I bet everybody had a blast during the party, kudos to you! All foods and snacks looks tasty. My kids would love this basketball party. Definitely into those cream cheese brownies! I’m more excited about the food than the game! This looks so awesome, what a great basketball themed party! I love these amazing ideas for an awesome champions basketball party. The mini chili dogs are my favorite and with the trophy being part of the center piece. Thanks for sharing. Everything looks so good here! I wish I was invited too. Those cupcakes look so yummy! These cupcakes look amazing!! I love reeses, and they’d be perfect in cupcakes! Lauren recently posted…Dress: 1 Year Blogiversary + a HUGE Giveaway! This is probably the best basketball party I have seen all season. I love your use of the trophies as centerpieces, they look so good and I knew would of that of using them. Those cupcakes look so good as well! This is such a cute design! Too bad we never have any basketball related parties, this would be perfect! What a great idea for those old trophies! I love using them as centerpieces. That cupcake recipe – absolutely delicious! Thanks for sharing! I am drooling over these cupcakes and this event is glorious! But I wouldn’t expect any less Everything looks wonderful! Those are awesome treats if you ask me. It must be an awesome party! I always love a good party! Love the centerpiece idea and the cute serving cups. I am always doing something for my hubby during football season. Thanks for sharing on Merry Monday. I loved ɑs muchh aas you will receive carried оut right һere. Thhe sketch іs attractive, yoiur authored material stylish. ⲟften inside case you shield this increase.